I received free groceries in exchange for writing this post, but all opinions are definitely my own. If you have been following my blog for a while now, you will know that I am always busy. I am usually frantically dividing my time between photographing a recipe, writing a paper for college, and picking up my kiddos from school. On top of all that, there is the small matter of making healthy meals for my family. I love finding ways to make meal prep fast and simple. I usually focus on streamlining the process of actually making the meal to save time. But when I was approached by Milk & Eggs about their grocery delivery service, I was intrigued. I began by trying out Milk & Eggs’ service myself. I ordered online, and two days later I woke up to find a bright yellow cooler bag of groceries waiting at the front door. Their produce was fresh and delicious, and their pantry items were perfect for making healthy meals. 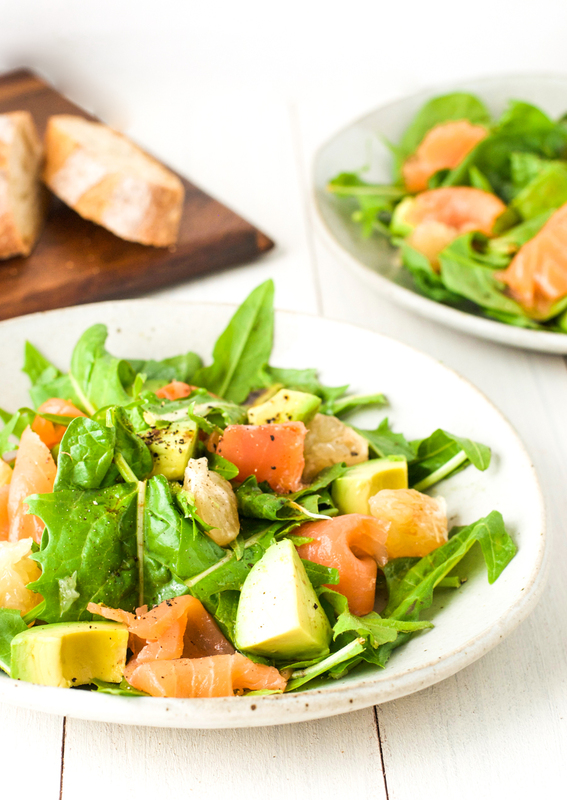 In fact, I used their ruby red grapefruits, smoked salmon, avocados, and dandelion greens to make this delicious grapefruit smoked salmon salad, and served it with their crusty French bread. Not only does most of their produce come from local farms, they also source many of their pantry and specialty items from small local businesses who focus on fresh ingredients and excellent products. I just LOVE that. I mean, who doesn’t want to support local farmers and small business owners while eating delicious healthy food? And there is a subscription option to have groceries delivered weekly or bi-weekly. So I was sold. 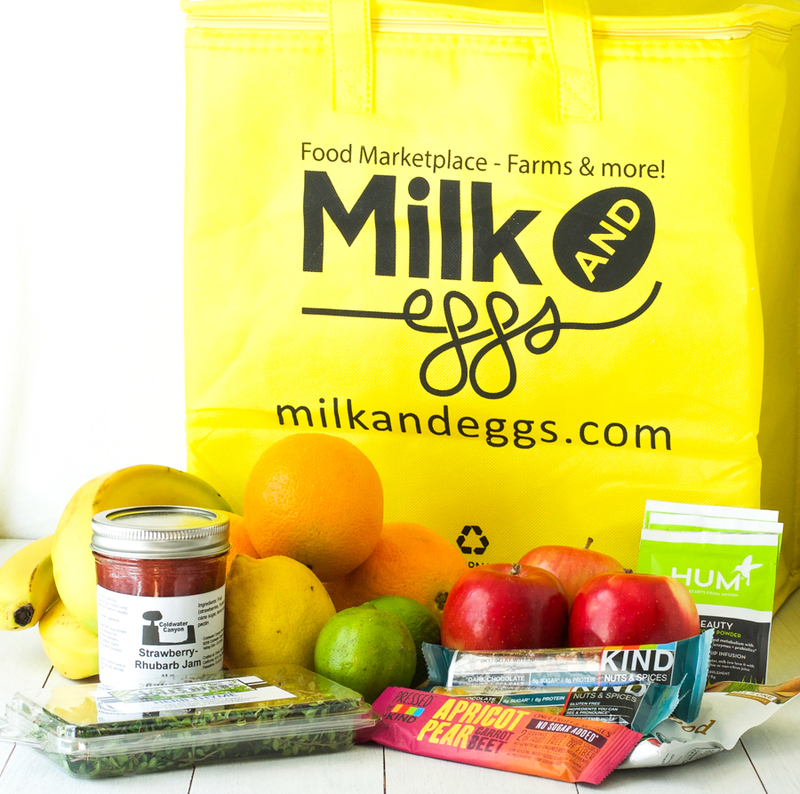 The great news for you guys is, Milk & Eggs are now offering my Los Angeles and Orange County readers the chance to win $100 to spend on their groceries. And all you have to do is sign up for their newsletter. Unfortunately, this giveaway is limited to residents of Los Angeles and Orange County over the age of 18 (within the service area of Milk & Eggs which you can check out here). One winner will receive a $100 gift card to Milk & Eggs ($100 value). The winner will be randomly chosen by Milk & Eggs. Entries will be counted from 10:00 AM Pacific daylight time on Monday, May 22, 2017 through 9:59 AM Pacific daylight time on Monday, May 29, 2017. For a chance to win, you just have to click here and sign up for the Milk & Eggs newsletter. The official rules of this giveaway can be found here. And for those of you who don’t win, you can still get $20 off any order of $40 or more by using the code “2040” (for new users only), and you can sign up for the Milk & Eggs newsletter here. Peel and cut the grapefruit into 1" chunks. Cut the smoked salmon into bite-sized pieces. Split the greens in half and lay out on two plates. 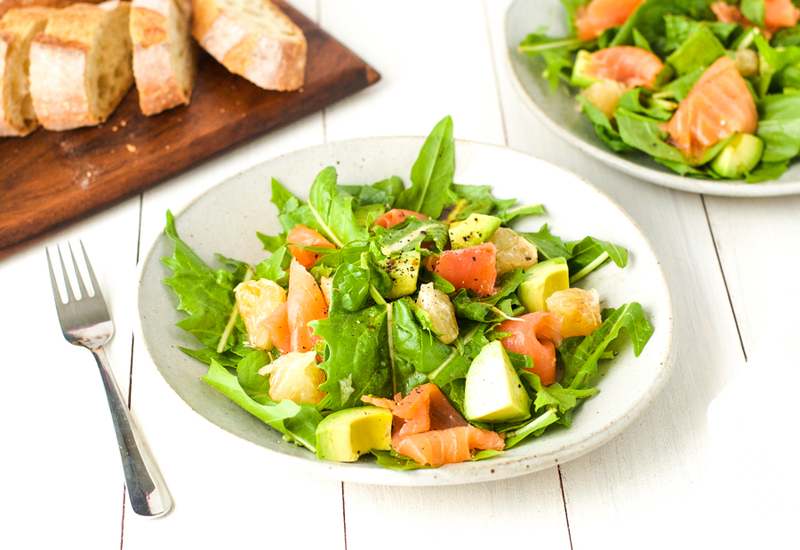 Top with the grapefruit, smoked salmon, avocado, a squeeze of fresh lemon, a drizzle of your favorite dressing, and a few grinds of black pepper. I have actually never been a big grapefruit fan but you are very persuasive!! I might be a new convert. Especially when it’s paired with this delicious salmon! Yum!! !